You'll be £20.00 closer to your next £10.00 credit when you purchase HMS Gannet. What's this? HMS Gannet, beautifully restored today at Chatham Historic Dockyard, is a fine example of the small ‘colonial schooners’ that were built and deployed in the second half of the nineteenth century to police Britain’s great empire and enforce the peace of Pax Britannica. Launched at Sheerness in 1878 with her white Mediterranean livery and elegant clipper bow, she was the epitome of the colonial gunboat. 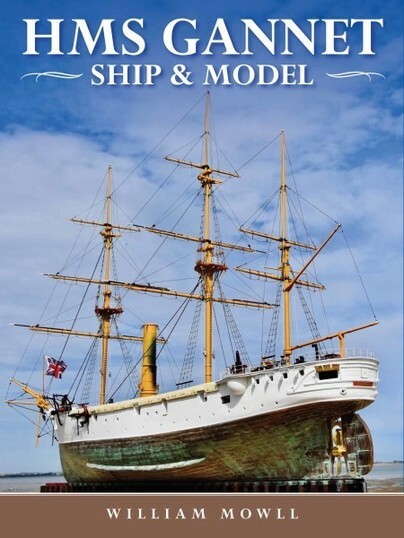 In this new book by the well-known ship modeller Will Mowll, the design and history of Gannet is outlined before the author takes the reader on a detailed photographic step-by-step exposition of the building of his 1/48 scale model of the ship. A particular feature of the model is the inclusion of a static representation of the 2-cylinder compound steam engine with its three cylindrical boilers. Exquisitely detailed, with even the bunkered coal beautifully modelled, all the machinery is made visible by means of the removable deck. The author has therefore reconstructed a major feature of the ship which is no longer extant on the prototype at Chatham. All the information that a ship modeller might need is included here – hull construction and the coppering of the ship’s bottom, the making of the ship’s steam propulsion systems, the decks and decking, armament, steering gear, mast and yards and rigging, and even the furniture in the wardroom. No part of the ship is left hidden. Inspiring with the sheer quality of his workmanship, the author has brought beautifully to life another of Britain’s great museum ships. All the information the shop modeller might need is included in this book, not least hull construction and the coppering of the ship's bottom, the building of the static steam propulsion systems, the modelling of the decks, armament, steering gear, masts, yards and rigging; even the furniture in the wardroom is described. Inspiring with the sheer quality of his workmanship and superb colour photography, the author has brought to life another of Britain's great museum ships. I'm sure that this book will become the definitive reference work for anyone wishing to build a model form this era of British naval history. ...This a book that will be appreciated by scale modelers of any standard, and also by anyone interested in the warships of the later Victorian period. It is a must for those of our readers who have enjoyed Will’s publications in our pages here. FRED M WALKER served a shipbuilding apprenticeship at Denny of Dumbarton whilst studying engineering at Glasgow University. He was then Shipyard Manager of Hall Russell before being appointed Naval Architect at the National Maritime Museum. He has been involved in the design of replica ships and serves on the Technical Committee of Lloyds Register.